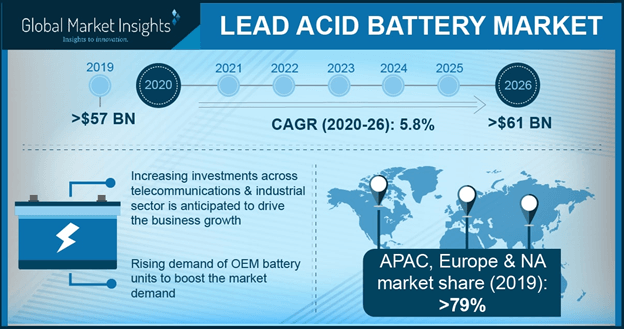 Lead Acid Battery Market size was valued at over USD 50 billion in 2017 with annual sales set to surpass 800 Million Units by 2024. Growing demand for reliable and cost-effective power supply for critical power applications will stimulate the global market size. In addition, ongoing research & development programs aimed at reducing the costs and environmental impact of these batteries will further support the industry growth. For instance, the DOE's Energy Storage Program funds the research and testing to enhance the performance and lower the cost of Lead-Acid Batteries (LABs). Increasing automation accompanied by growing deployment of vehicle charging infrastructure will further complement the industry landscape. Strengthening economic growth across the emerging economies accompanied by a significant expansion in the data center, telecommunication and automotive industries will drive the global market growth. These batteries continue to be the most preferable chemistry on account of their easy availability and competitive price index. Moreover, increasing foreign direct investment along with infrastructural expansion will further create cyclical demand for LABs as a source of backup power. Stationary lead acid battery industry is predicted to expand over 5% by 2024. Increasing focus toward improved power quality driven by growing dependency on electronics will fuel the industry growth. These units find prevalent applications in backup power, utilities, emergency lighting, security systems, renewable energy systems, railway backup systems, O&G explorations, and others. SLI lead acid battery industry, in 2017 was valued over USD 25 Billion. These units cater to the conventional automotive applications including vehicles with start-stop functionality and micro-hybrid systems. The ability of SLI batteries to provide reliability, low combined cost and compatibility will sustain their dominance over the coming years. An SLI or Start-Lighting-Ignition LAB is deployed to start the engine and supply the 12 V electrical system of a vehicle. Motive, also known as traction batteries provide power for motion and are deployed in vehicles including industrial trucks, mini vans, forklifts, tourist coaches, golf carts, and ebikes. China constitutes a major proportion of the global motive lead acid battery market, primarily driven by the widespread use of ebikes in the country. VRLA lead acid battery market is predicted to expand over 6% by 2024. Safe handling capabilities, lower self-discharge rates and high resistance to vibration are some of the key features that will accelerate the penetration of these batteries across the industry landscape. 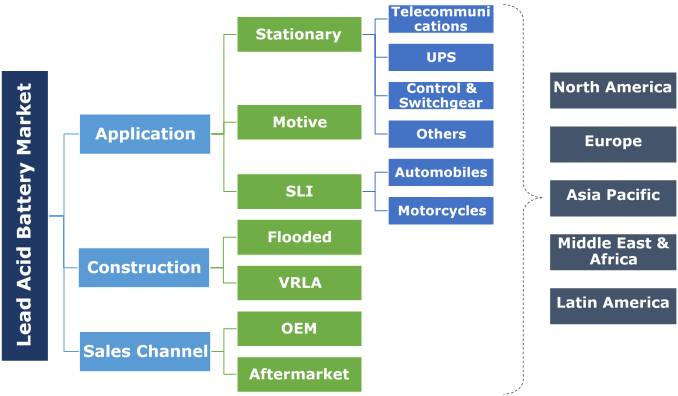 VRLAs offer high-performance power source for applications including power backup, telecommunications, emergency lighting, and consumer products. Flooded lead acid batteries offer relatively lower cost and are the oldest chemistry with their predominant use across industrial trucks. However, these units on account of their high-maintenance requirements will continue to lose dominance to advanced VRLAs across other applications. In addition, the inability to store comparable energy as much as VRLA and the tendency to sulfate make these unattractive for clean power applications. The indispensable need to replace batteries during the lifecycle of a backup energy device will drive the aftermarket for lead acid batteries. The aftermarket sales offer a lucrative prospect to equipment vendors predominantly across SLI/automotive applications. The lead-acid battery aftermarket is driven by the replacement of used LABs that come to the end of life in vehicles or other devices. The Original Equipment Manufacturer (OEM) lead acid battery market is predicted to grow over 5 % by 2024. The demand for OEM batteries is majorly driven by stationary applications and industrial forklifts shipments. The U.S. lead acid battery market will witness growth on account of massive legislative investments aimed at enhancing domestic battery manufacturing capacity. For instance, the Battery Council International (BCI) have invested heavily to venture into cutting-edge applications of these LABs including wind, solar, utility-storage, hybrid & stop-start vehicles, and others. In addition, shifting trends toward electric forklift technologies across the country’s material handling equipment industry will further boost the deployment of advanced lead acid batteries. Asia Pacific lead acid battery market will witness an appreciable growth on account of flourishing automotive sector, most notably across China, India, Malaysia, Indonesia, and Vietnam. China represents the major producer and consumer of LABs, on account of sizeable rising output from manufacturing sector coupled with increasing consumer spending, with additional legislative support toward infrastructure expansion. Notable industry players operating across the global lead acid battery market include East Penn Manufacturing Company, Johnson Controls, Enersys, Furukawa, Mutlu, MEBCO, Leoch International Technology, NorthStar Battery Company, Fengfan, Hoppecke Batteries, Amara Raja amongst others. The global market is highly fragmented characterized by the participation of global players and an increasing number of niche regional vendors. Strategic marketing initiatives, brand equity and product differentiation are the key assets to enhance competitiveness in the marketplace while mitigating the risks of counterfeiting. A Lead Acid battery (LAB) is defined as an energy storage solution, primarily deployed as a power source for automotive propulsion and industrial applications. LAB is a secondary or rechargeable battery composed of lead-dioxide cathode, sulfuric acid solution electrolyte and a sponge metallic lead anode. In addition to automotive and traction applications, LABs are deployed as a source of backup to ensure uninterruptible power supply during a failure.